Jim Root speaks to Sidney students on Monday, May 9. As a professional fisherman, Jim Root has plenty of stories to tell, be it about a great day on the water or the one that got away. His story Monday at Sidney Central School wasn’t necessarily about being on the water, but it might have been one of the biggest catches of his life. 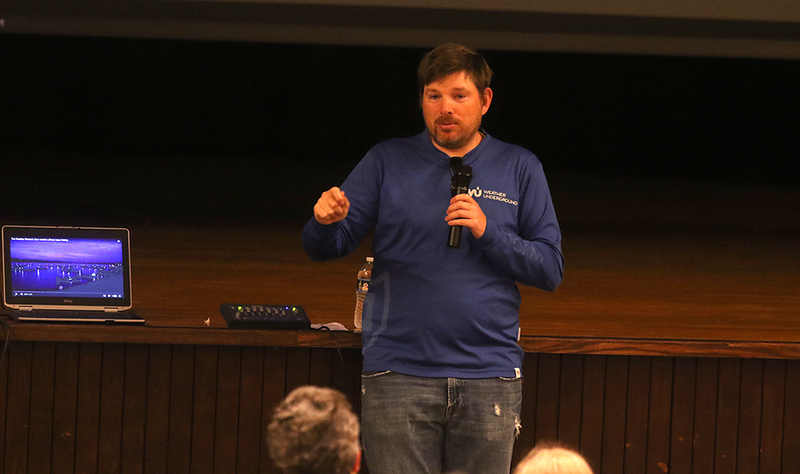 During an hour-long assembly with seventh and eighth graders, Root talked about how he pursued his dream to become a professional fisherman and writer. Root, the son of former Sidney teacher James Root, recently donated a weather station to the school, and spoke Monday with students about how the station helped him in his career, as well as telling his story of being persistent to get to where he is now. His message to students was to follow dreams and utilize their education. A writer for as long as he can remember, Root said he left corporate life to pursue writing about fishing, as well as being paid to fish. The road wasn’t easy and he had a lot of ups and downs along the way. The weather station Root donated to the school played a big part in his career as he became the first pro fisherman to have a personal weather station with him. It also helped as he wrote his articles and pitched ideas to publications. Root wanted to donate the weather station in memory of his late father, said Sidney science teacher Diane Burnham. The weather unit is valued at about $2,000 and was accepted as a donation by the Sidney Board of Education in February. The top-of-the-line unit gives data such as barometric pressure, humidity, temperature, and wind speed/direction. It also reports the temperature inside the school. The initial plan is to use the data in seventh-grade physical science, but Burnham said she hopes it will eventually be used in earth science, meteorology, and agriculture classes. The school will be able to access information via Weather Underground. During his talk to students, Root took students through his journey to becoming a fisherman who has more than 50 top-10 finishes. It wasn’t easy starting out as he attempted to write for many publications and website. He got a break when a segment on the Weather Channel featured him and his weather station. That helped him move further into his career and now has the ability to write for several platforms. In fact, his website (jimrootfishing.com) had more than 2.5 million unique hits last year, and more than 8 million total hits. His work is featured in several places, including Weather Underground, which he said averages more than 10 million hits per day. Following his talk, Root fielded several questions from students about his career, fishing competitively, the equipment he uses, and how he has reached the level he’s at.